Network Welcome to the social aspect of biipmi.com. Stay connected and keep in touch with people you know and expand your network with people of common interests by joining cliques. Access this feature by clicking on the Menu icon, then click Network. Friends Friends are people you know that you wish to connect and befriend with. Befriending allows you to post and comment on their walls and vice versa. Friend Request There are plenty of ways to go about sending a friend request. 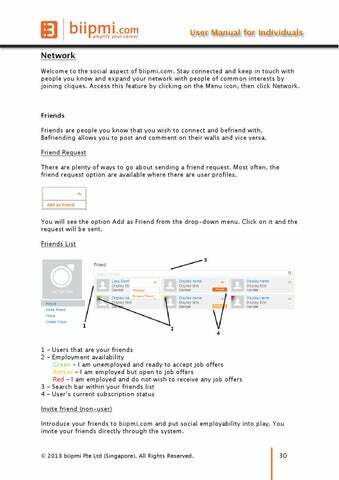 Most often, the friend request option are available where there are user profiles. 1 – Users that are your friends 2 – Employment availability Green – I am unemployed and ready to accept job offers Amber – I am employed but open to job offers Red – I am employed and do not wish to receive any job offers 3 – Search bar within your friends list 4 – User’s current subscription status Invite friend (non-user) Introduce your friends to biipmi.com and put social employability into play. You invite your friends directly through the system.